Firstly this has nothing to do with the much better 18 weapons of Kung Fu starring Gordon Liu. 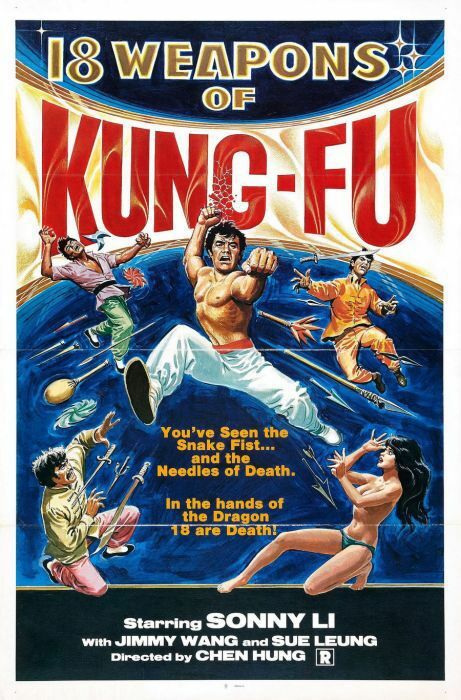 I mention this as my Kung Fu Theater presents DVD has a totally misleading picture on the cover, the wrong plot on the back and goes on to mention (no idea why) The Young Hero starring Hwang Jang Lee. Apart from an introduction to the history of the 18 weapons style told by a monk to some children during the opening and the usual mysterious manual that everyone is after, the weapons never really appear again and the fights are all boxing style. The hero is Lee Shao Hwa who I have never heard of before or any of the other actors. The film mentions another director Wu Yuen Ling as well as the one IMDb lists. The other actors are Wang Fu Quen, Wang Wing San, Chen Fei Fei, Wang Ki San, Suen King Kai and Hwa Yue Suen who seem to have sunk without trace after this film. The fights are reasonable and frequent but not great and the ‘star’ doesn’t have much charisma. The twist at the end is just stupid and the film seems to end abruptly as though they got bored with it. The scenery and the training sequences in the river are a little different from usual. Unfortunately the pretty sister gets drowned not the very irritating (though acrobatic) young boy.